R. Lee Ermey was many things. He was an actor, a rebel, and a public speaker. Above all Ermey was a United States Marine, patriot, and devoted to the Second Amendment. Ermey, who died on Sunday, is without question the most famous drill instructor in history both in film and real life. His passing is a reminder of this great man and the fine men and women of the Drill Sergeant and Drill Instructors Corps who have molded generations of Marines and Soldiers. 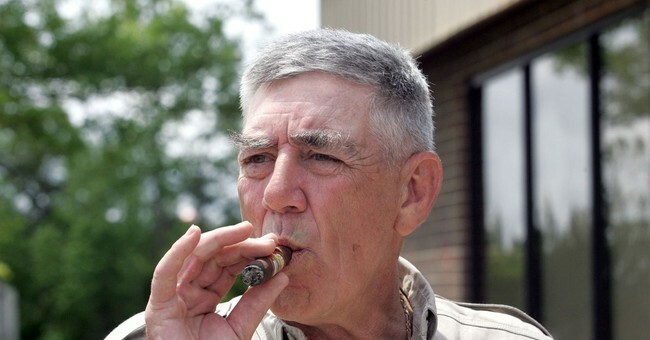 Ermey was born in 1944 in Kansas. Having gotten into trouble as a youth he was given a then popular, and now outlawed choice, “Go in the military or go to jail.” Ermey joined the United States Marine Corps and found his lifelong calling. He served almost a year in Viet Nam and became a Marine Corps Drill Instructor during his time in the Corps. However, he was retired for medical reasons from his beloved Corps in 1972. The Marine Corps was Ermey’s life and he was not sure what to do. He opened a questionable establishment in The Philippines soon after leaving the Corps and then used his GI Bill to go to school for acting. He got a role in Francis Ford Coppola’s classic, Apocalypse Now. That film was simply a preview of what was to come. Ermey was secured to be the technical advisor of Stanley Kubrick’s Vietnam War epic Full Metal Jacket and soon showed Kubrick that he could do a better job than the person playing the role of the Drill Instructor. Ermey ended up getting the part and made cinematic and cultural history. Ermey’s speech to the new Marine recruits, as the fictional but very realistic Gunnery Sergeant Hartman, remains the most memorable opening monologue in film history. After Full Metal Jacket, for the first time, people were influenced to join the service not because of glorious scenes of ground warfare, aerial dogfights, homecoming parades, or the awarding of medals. Instead, Ermey’s realistic portrayal of the rigors of basic training gave motivation to join. Ermey remained an established authority figure in film, including as the Mayor in Mississippi Burning, the judge in Murder in the First and the prison guard in The Naked Gun 33 and a 1/3. Increasingly, as his status grew, Ermey was called upon to support the U.S. military and in particular his beloved Marines. In 2002, Ermey became the only retired Marine who ever received an honorary promotion from the Commandant of the Marine Corps. Now he would forever be, as he already was in the hearts and minds of his troops, Gunnery Sergeant, or Gunny. He hosted Mail Call and other shows that helped bridge an increasing gap between the American public and its’ military. Despite his continuing public service, in Ermey’s later years he was increasingly shunned by Hollywood the more his conservatism became known. However, Ermey remained true to himself, his beloved Corps, and the military. They were his extended family and while they had their actual Drill Instructors and Drill Sergeants, Gunny was always their first Drill Instructor; the first one they had ever seen on screen. R. Lee Ermey’s passing reminds us of one of the important and overlooked figures in keeping traditional American society; Drill Sergeants and Drill Instructors. Increasingly, for American males without a positive father figure, Drill Sergeants and Drill Instructors became the first male to teach them loyalty, discipline, duty, and honor. These drills have been molding generations of to fight in the jungles of Vietnam, the beaches of Grenada, the deserts of Iraq, and mountains of Afghanistan. No single figure is regarded by the same person with so much hatred at times and yet so much respect. Some recruits and privates even decide to want to be drill instructors or drill sergeants after being so inspired by their drill or by Ermey. Undoubtedly, there are generations of Marines and Soldiers that will continue to join the service because they saw R. Lee Ermey shaping a bunch of “maggots” who were “all equally worthless” into Marines. Well done, Gunny. You’ve earned your promotion.